Combined measuring station allows both surface roughness and contour measurements to be performed at a single measuring station. Depending on the measuring task, either the GD 25 drive unit for surface roughness measurements or the PCV drive unit for contour measurements can be activated. 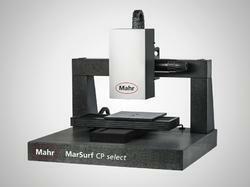 MarSurf XR 20, the perfect introduction to top-class surface metrology. The PC-based instrument delivers all common surface parameters and profiles in accordance with international standards, both in the measuring room and in production. The powerful MarSurf XR 20 combines decades of experience in surface metrology with innovative technology, easy-to-read icons and user-friendly operator assistance. A sampling length of up to 120 mm is possible in conjunction with the GD 120 drive unit. In addition to surface roughness evaluations, profile and waviness evaluations can also be performed in this way. Combined contour and roughness measurements in just one step comes courtesy of proven cutting edge technology from Mahr metrology. The MarSurf LD 130 and MarSurf LD 260 measuring stations have been systematically developed to draw on the experience from the first generation of equipment. Easy comparison of nominal and actual profiles. A standard surface measuring station can be expanded into a user-friendly, semi-automatic CNC measuring station simply by adding auxiliary table axes and possibly a measuring cabinet. The MarSurf CNC concept is a high-quality solution for surface roughness and contour measurement in fully automatic manufacturing processes.Mahr has set standards worldwide with this measuring station concept. Complex measuring tasks can be performed fully automatically, without operator influence, reliably and with complete control. In conjunction with the probe arm changer, fully automatic procedures can be performed without operator influence with manual probe arm replacement, even in complex, multifaceted measuring tasks. A coordinated range of components, comprising motorized table and auxiliary axes along with tried-and-tested drive units and probe systems, forms the ideal basis for a perfect solution. The MarWin software platform from Mahr is a sophisticated, modular, cross-product control and evaluation system offering the necessary flexibility and process reliability for CNC operation in particular. Up to 10 different probe arms from the LD system can be changed fully automatically. 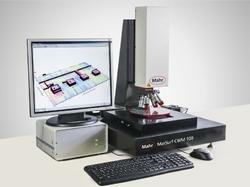 MarSurf CWM 100, a precision, computer-controlled optical measuring instrument with sub-nanometer resolution. This combined 3D measuring system comprises a confocal microscope and white light interferometer. 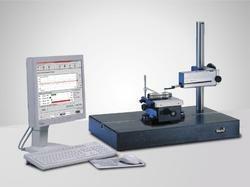 MarForm measuring machines have been recognized for their accuracy and stability. The new MarForm MFU 100was developed with the claim of testing the shape and position features of product parts in a one liter measuring volume close to the production area and at a reasonable cost. In so doing, it has taken our long experience into a new dimension. 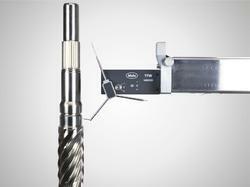 All axes are coordinated to ensure maximum measuring reliability. The horizontal X-axis extends beyond the center of the workpiece, allowing "true parallelism" to be checked free from other measuring influences. The tangential Y-axis is an innovative new feature. 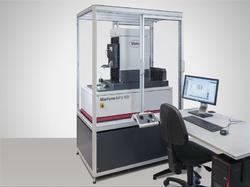 This additional motorized axis, which is new to conventional form testers helps to locate the zenith of miniature workpiece geometries without operator influence. The actual precision measurement can then be started in exactly the right place. This significantly increases process accuracy. The Y-axis is used together with the vertical Z-axis and the horizontal X-axis to determine the workpiece diameter. This allows tolerances to be checked in the sub-nanometer range by the maximum material principle, in accordance with standards, for the very first time and at a very reasonable price. The MarWin software package offers the full range of functions of a modern measuring and evaluating application including user friendly records and electronic documentation in the company network. The rigorous separation of control and evaluation functions ensures that MarForm MFU 100 is future-proof and expandable. New language versions, special evaluations and new standards are easy to incorporate. The MFU 100is also ready for the addition of future sensor systems. 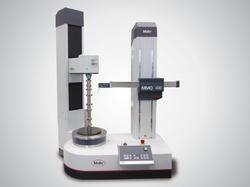 MFK form measuring center for comprehensive workpiece assessment. MFK form tester - ideal for testing engine blocks, cylinder heads, gear cases, hydraulic elements, crankshafts and camshafts. Generously sized, optimized design for high measuring accuracy throughout the machine. 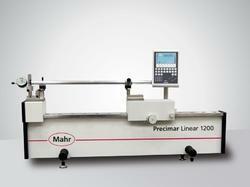 Long measuring and travel paths for easy, safe workpiece changing. 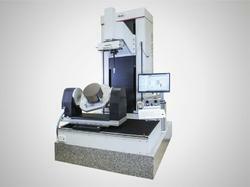 The form tester is based on a non-warping granite base, which is set up so that it is isolated from vibrations. 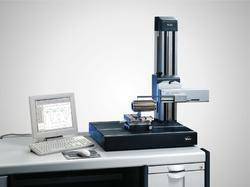 Its high precision horizontal surface forms the datum plane for the measuring setup. The workpiece holder table supports and guides heavy workpieces by means of air bearings on the granite surface. Horizontal axis (X) with 180 mm or 280 mm measuring length and with digital linear scales in the X and Z axes; high probe position accuracy for measurements requiring high reproducibility. 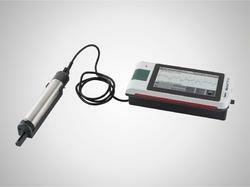 Manual or fully automatic probe with short measuring circuit, high linearity, low measuring force. Probe arms for T7W, optimized for piston measurement, are available as an optional accessory pack. (gives the offset between an oval and the piston axis). In industrial manufacturing metrology the need for quick and easy measurement of workpiece profiles is on the rise. The wide variety of measuring tasks demand ever greater precision and optimum measuring strategies for the overall system. With a view to reducing the costs and time associated with measuring tasks, there is a growing demand for a single machine for measuring form and position, roughness and contour. Decades of experience in contour metrology combined with the expectations of and feedback from our customers have helped to shape this new generation of devices. What started some 30 years ago with the Conturograph, which was used for recording contours and comparing them with templates, has grown into a top-quality contour measuring system using cutting-edge technology. 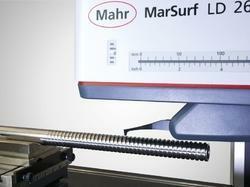 With the MarSurf XC 20 and MarSurf XC 2 contour software, Mahr customers can now rely on superb quality and safety. So what would be more obvious than also to record and document roughness parameters such as Ra and Rz when testing your workpieces with a MarForm measuring instrument. And then after measuring the form and position features, also to carry out the contour tasks at the same time, without having to move the workpiece to a second measuring station. 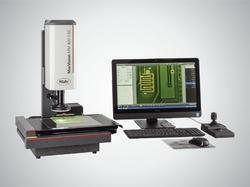 Combine the checking of form and position tolerances with the monitoring of contour features and roughness parameters. 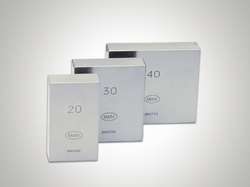 The 826 PC gage block measuring instrument is quick, reliable and highly accurate. An open and extremely rigid L-shaped stand forms the base for the two counteracting precision measuring probes and the measuring table. The evaluation program runs under Windows 7 Ultimate. 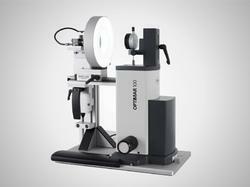 The OPTIMAR 100 is the most cost effective test station for the partially or fully automated testing of dial indicators, dial comparators, dial test indicator measuring devices and 2 point bore gages, as well as inductive and incremental measuring probes. 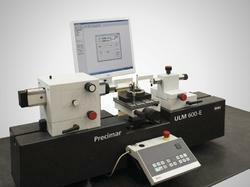 OPTIMAR 100 with image processing is the most cost-effective test station for the partially or fully automated testing of dial indicators, dial comparators and test indicators. The retrofit kit for image processing enables you to complete your motorized dial indicator test device with the possibility of a fully automatic reading of the displayed values of the test objects (pointer or numeric display) by camera and image processing, which makes the testing process considerably easier. 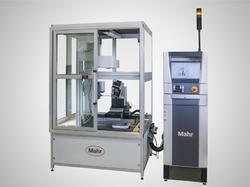 During the automated testing process, the released capacities of the operator can be used for other working tasks. 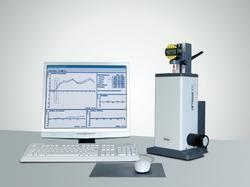 The QMSOFT software system controls the dial indicator test device Optimar 100 and processes the camera image (pointer or numeric display of the test object) and the reference measuring values of the dial indicator test device Optimar 100; it also performs all the subsequent processes related to gauge management. The output of the inspection results are numerical data lists and graphics showing the deviation course. Tolerance excesses are marked and identified. Support the inspection of this gauges according to the worldwide mostly used standards. 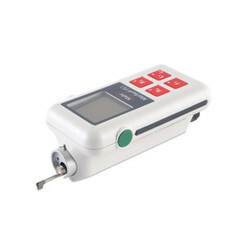 The Elcometer 7062 surface roughness tester is a light weight and portable measuring solution for the range of surface roughness measurements required for compliance to International Standards. In protective coating applications there is a requirement to measure surface roughness. 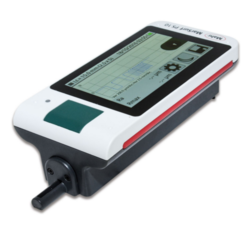 With 31 surface parameter settings available the Elcometer 7062 surface roughness tester can display all parameters that comply to National & International Standards. These values include peak-to-valley profile measurement in combination with an assessment of the frequency of peaks within the sample area. The Elcometer 7062 surface roughess tester is a light weight and portable measuring solution for the range of surface roughness measurements required for compliance to International Standards. 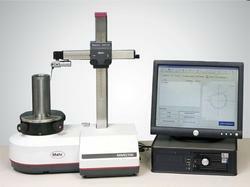 The unit is also suitable for assessing surface roughness conditions in a wide range of general industrial applications; particularly where the sample is too large to bring to the laboratory. Multi-Lingual Display: All the required information is displayed on screen in a choice of 17 languages. Flexible: Can be used in virtually any position; horizontally, vertically, upside down. 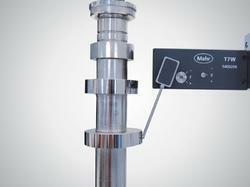 A height adjustment accessory to accommodate various sample sizes is supplied with each gauge as standard. Integrated Calibration Standard: No external calibration standard is required; provides greater ease of use. Removable Drive Unit: Drive unit can be removed from main unit and used with an extension cable (included) to allow for measurement in hard to reach areas. Stylus pick-up with removable protection: 2µm (80µin) diamond stylus tip with a measuring force of 0.7 mN. Different stylus’ are available for various applications. Outstanding calibration processes based on many years of experience, including geometry calibration, measuring force calibration, bend compensation, etc. MMQ 400-2, MMQ 400-2 tailstock and MFU 100, with T7W probe and with Mahr's MarWin 5 or higher evaluation software. 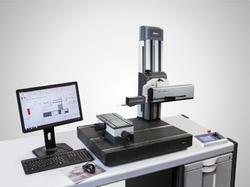 The MarWin-based measuring and evaluation software AdvancedForm now includes a new Wizard. It can be used for measuring cam profiles from a circular movement with X-axis follow-up, and for cam profile evaluation and recording. The measurement and evaluation of cam profiles thus fits seamlessly into the AdvancedForm user interface where, along with the form and position measurement wizard, it can map even very extensive and complex measuring tasks as part of a teach-in program. This Quick&Easy Cam function (QE CAM) is covered by a separate, optional license, so the range of functions of the MarForm measuring machine can easily be extended at any time to meet new requirements. When the camshaft is clamped between centers, the record is produced in moments. The "motorized tailstock" option for the MarForm MMQ 400-2 saves time by eliminating the need to align the workpiece, thus optimizing your measuring process. You can load the nominal cam form as a file or create or edit it in a wizard. MarForm tracks this nominal form on the cam and shows you a detailed view of your cam profiles, with the tolerance bands you defined. You can then toggle between a contour view and a tolerance band deviation view using a freely definable form factor. Other cam-specific features such as stroke curve and cam angle are also evaluated. The QE CAM function also offers special evaluations such as the acceleration curve and velocity curve, calculated from the profiles. The additional references for the form and position features are easy to define with the AdvancedForm teach-in program. The principle here is "What you do is what you get"! With the probe arms you can choose from spherical, blade or disk measuring anvils. Unknown cams are measured automatically by the MarForm and can be used as reference data for your measurement series (tracking mode). This additional option for your MarForm measuring station extends its range of functions, making the workpiece testing process fast, efficient and comprehensive. 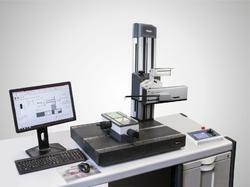 The MarForm MMQ 100 form tester is the ideal solution for simple yet precise measuring tasks. MMQ 100 with EasyForm is a powerful PC based evaluation system running under Windows® 7. It offers meaningful color reports with user friendly software for evaluating form and position tolerances (DIN ISO 1101): roundness, roundness within sections, radial runout, axial runout, concentricity, coaxiality, flatness(1), straightness(1), parallelism(1), perpendicularity(1). 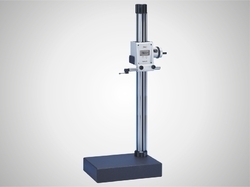 Our company is the leading company known for providing Surface Roughness Tester to the clients. This product is best in terms of quality, long working life and smooth functioning. Offered range is manufactured by our experienced professionals with the use of quality assured components and contemporary techniques. Multi-Lingual Display: All the required information is displayed on screen in a choice of 14 languages. 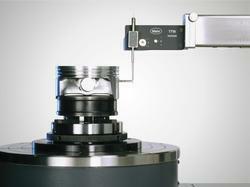 Drive Unit: Can be rotated and moved longitudinally; enables the stylus pick-up to be moved to the calibrating position. The stylus pick-up is also protected for transport in this position. Stylus pick-up with removable protection: 2m (80in) diamond stylus tip with a measuring force of 0.7 mn. Different styluses are available for various applications.